For more than a decade, Garmin has been a leading producer of fitness devices that help people achieve their goals. 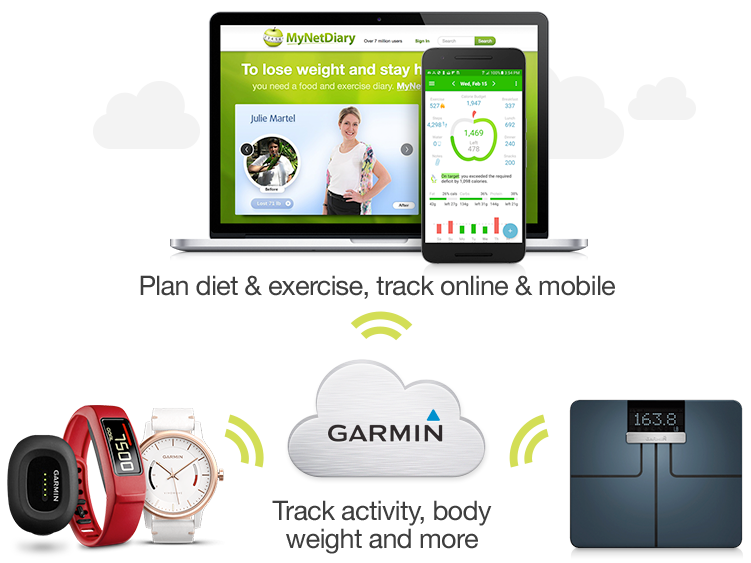 Garmin provides several families of products: activity trackers, such as vívofit® 2 wristband, vívokí™ clip-on tracker, vívosmart™ wristband, GPS smartwatches, and GPS running watches. Generally, if your Garmin device can upload information to Garmin Connect, MyNetDiary will be able to download it. How does Garmin linking work? MyNetDiary can download from Garmin Connect the total number of daily step count, calories burned while walking and running, sleep hours, weight-ins and individual workouts that you recorded with your tracker or logged manually in Garmin Connect. The specific information available depends on the Garmin device you use. For example, with vívofit® 2 you can download all of this information. With vívokí™, you can get daily step count, calories burned while walking and running, as well as workout calories. 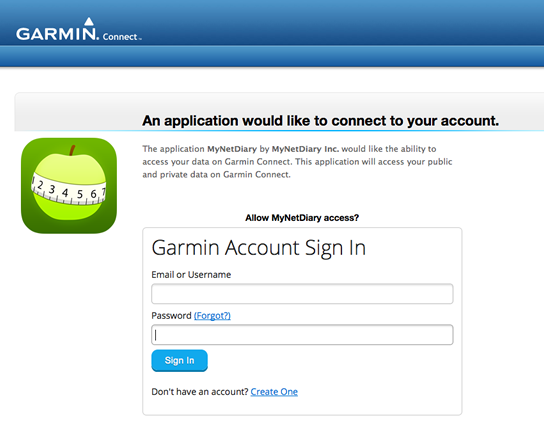 After you link your MyNetDiary account with Garmin Connect, MyNetDiary will automatically download your data from Garmin Connect within several minutes after you log foods in MyNetDiary, one download per hour. If you don't log foods on some day, MyNetDiary will download data from Garmin Connect at about 3am in your timezone. If information is available in your Garmin Connect account, MyNetDiary will download your daily step count, sleep hours, weight-ins and create several exercise records in MyNetDiary: one record for your daily step count (walking and running), and one record for each individual workout that is available in Garmin Connect - either recorded by the tracker or entered manually. This way, your activities and exercise registered by your Garmin tracker will be accounted for in your daily calorie balance in MyNetDiary. When you sync Garmin trackers to the Garmin Connect, MyNetDiary receives notification from Garmin Connect within several minutes and automatically downloads new data. Go to Activities screen in Garmin Connect. You can see a list of your daily activities there. These activities should be imported into MyNetDiary and listed in MyNetDiary's Exercises. Additionally, MyNetDiary may create a special "Garmin daily steps calories” exercise record. This record reflects your additional calories burned beyond Activities records in Garmin, for example calories you have burned while walking. Garmin mobile app calculates and displays all calories burned above "Resting Calories" as "Active Calories". These "Active Calories" include Garmin's "Activities" (already imported into MyNetDiary exercises). MyNetDiary additionally subtracts from Garmin's "Active Calories" the expected number of active calories for your Sedentary activity level in MyNetDiary, to include only calories you burn beyond expected and avoid double counting. After subtracting "Activities" and expected calories, MyNetDiary will create "Garmin daily steps calories" exercise record. For example, if you see in Garmin 856 Active Calories and two Activities with 100 and 200 calories, and MyNetDiary expected 420 calories typical for your weight and height, then MyNetDiary will create "Garmin daily steps calories" with 136 calories, calculated as 856 - 100 - 200 - 420. You can see your sleep hours on the same page, under "Sleep" tab. Please note that Garmin Connect shows hours and minutes, while MyNetDiary Sleep Measurements displays hours, so for example 7:30min in Garmin will be displayed as 7.5 hours in MyNetDiary. Go to Weight page in Garmin Connect to see your weight-ins. If you see large differences between Garmin Connect and MyNetDiary, please make sure your timezone is set correctly in Garmin Connect and MyNetDiary. In the case you do not log foods in MyNetDiary for 10 days, MyNetDiary stops downloading from Garmin Connect. When you resume logging foods, MyNetDiary resumes downloads from Garmin Connect. MyNetDiary downloads history for 10 days before the day the link is established or restored. If you want to expedite downloading today's exercise and body measurements, go to Account tab, click Garmin link to open Garmin Settings page, then click "Verify Link" button. Note that data will be delivered to MyNetDiary with few minutes delay. Garmin data is transferred one-way only, from Garmin Connect to MyNetDiary. By creating a link, you authorize MyNetDiary website to read your Garmin data and write these data under your MyNetDiary account. How do I link MyNetDiary to Garmin? Linking with Garmin is provided (along with many other great features) for MyNetDiary Maximum accounts. If you don't have an account with MyNetDiary, you can Sign Up. You can get started by following the directions at Garmin Connect website. 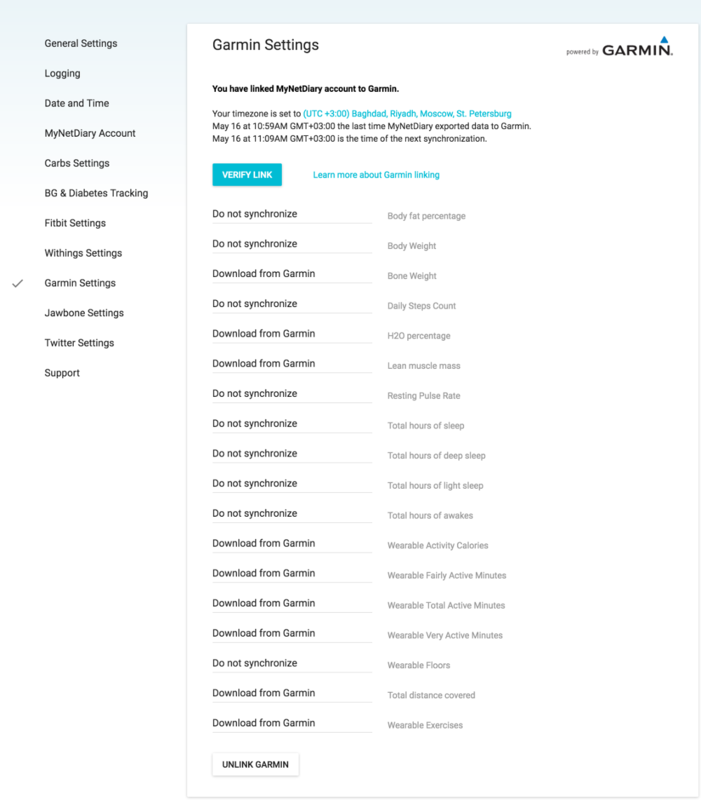 Once you have created a Garmin Connect account, make sure you can see at Garmin Connect website data uploaded from your Garmin device. Please notice that this page shows if Garmin is already linked, and allows you to verify the link if you are linked already. You will be redirected to connect.garmin.com website, where you will need to sign in to your Garmin Connect account. After successful sign in, you will be asked if you allow MyNetDiary to connect and access your data. 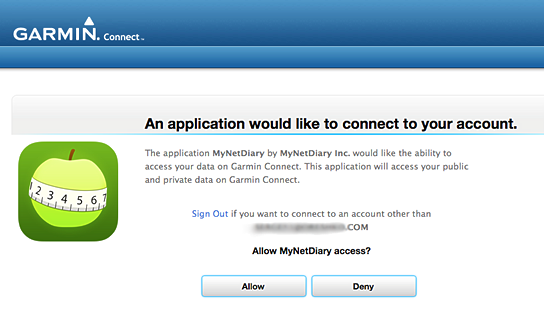 Once you click the Allow button, you will be returned to MyNetDiary.com Garmin Settings page, where you should see "You have linked MyNetDiary account to Garmin" status message. You can terminate MyNetDiary link at Garmin settings page. In case you would like to repeat Garmin data download for the last 10 days, please, use "Verify Link" button.